You can now import the data from SEG-Y files and save it as a .dugio volume file. As requirements, you should define the output file and configure the writing options. Upon successful loading, Insight will add the output dugio volumes to the project database automatically. Tip: Data loading is a disk-intensive operation. It depends very much on how fast data reading and writing can go. If you are working in a less reliable network environment, consider loading the data on a local disk. Loading data from/to a local disk often results in better and more reliable performance than a network disk. Once data loading is completed, you can copy the data to the network disk. Output Filename — Click the Select File folder icon to create a file (.dugio extension) to store the traces. Type the new file name and click Open. Class (Data Type) — Select a class for the volume. The selected class will be used to display the volume when loaded in Insight. You can still change the class of the volume in Insight (see Changing Volume's Class). 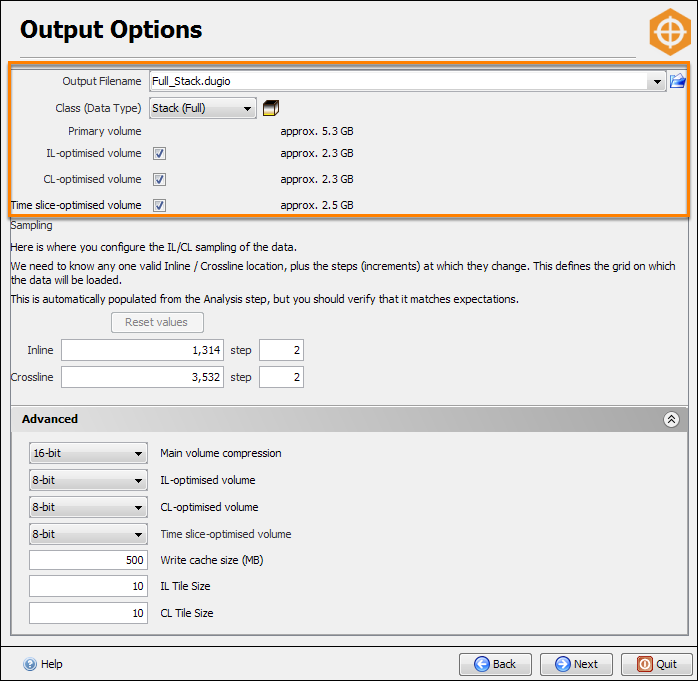 IL-optimised volume/CL-optimised volume/Time slice-optimised volume — Select these check boxes to generate the inline-, crossline- and time/depth slice-optimised volumes. Based on the compression settings which you can define in the Advanced pane, the estimated size of the optimised volumes will be displayed. If you are loading gather data, the gather dimension is displayed. Select the Use advanced gathers compression check box to write a discreet cosine transform (DCT)-compressed gather volume. Once you have enabled this function, you can type the signal:noise target (dB) value. Note: The writing of volumes with advanced compression requires the Data Management module. However, you can read the compressed volumes with any module in Insight. This section allows you to configure the desired horizontal sampling. For 3D inline and crossline, type the values and the corresponding increment (step). By default, the values are calculated from the previous analysis step and usually represent the actual horizontal sampling in the SEG-Y files (see Analysing 3D Data). However, 3D volumes are analysed by random sampling, hence you should always double-check the step. If you want to load a coarser sampling of the data, you can increase the step size in this section. Note that the SEG-Y Loader will not interpolate missing traces, so the step size must be a multiple of its original spacing. If you are loading gather data, then you can also change the gather dimension sampling in the Sampling section. Once you have changed the sampling, you can click Reset values to reset the sampling to its original values. Tip: To load a subset of the data, go back to the Filters step (see Filtering 3D Data). The Advanced panel allows you to change the compression settings for the main volume and IL-, CL- and horizontal slice-optimised volumes. You can select 8-bit, 16-bit or 32-bit. Main volume compression — By default, this is set at 16-bit. At this setting, the fixed-size compression ratio will be around 1.5:1, which translates to an output file that is around 60% the size of the input SEG-Y with a loss of precision of approximately 1 part in 65,000. 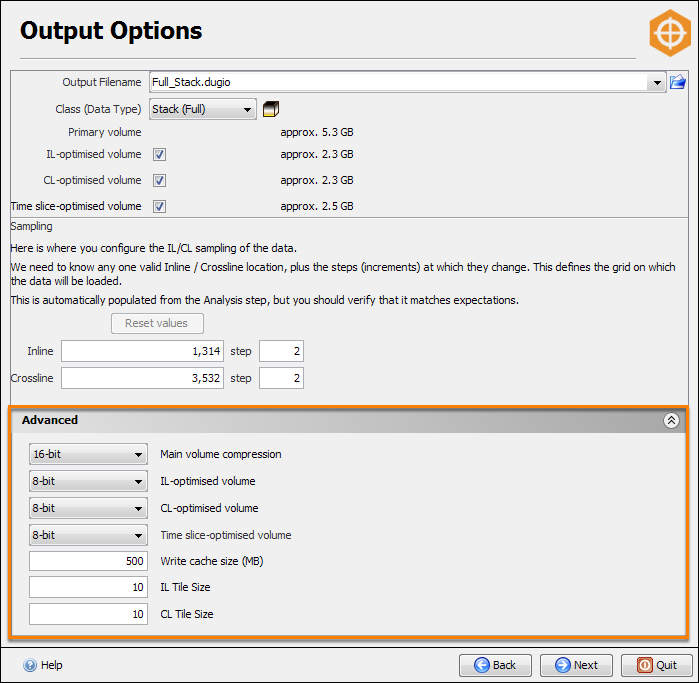 This compression setting is recommended for all de-spiked data, but not for unprocessed field data. IL-/CL-/Time slice-optimised volume — By default, 8-bit compression is set for optimised volumes which are intended for better display performance (not for re-export). 8-bit packed will give a fixed-size compression ratio of about 3:1, which translates to an output file of about 33% the size of the input SEG-Y with a loss of precision of about 1 in 250. Write cache size (MB) — Normally, you do not need to change this setting. The SEG-Y Loader will estimate the amount of memory needed to load the volume and will suggest a larger amount if necessary once you click Next. Cache is needed to do the re-sorting of traces so that they could be read faster in normal operation. IL/CL Tile Size — Usually, you do not need to change these values. The tile size affects the layout of the data on disk. When you are satisfied with the settings, click Next to start the writing process. Tip: Reducing the tile size lowers the required cache size. This is useful when you are loading huge gather datasets. However, if you are writing a DCT-compressed gather, the tile size parameters will not be displayed. We advise that you do not generate the optimised volumes if you are loading a huge gather dataset as this will help to speed up the writing process. The optimised volumes will only speed up common-offset slices and may not be required. 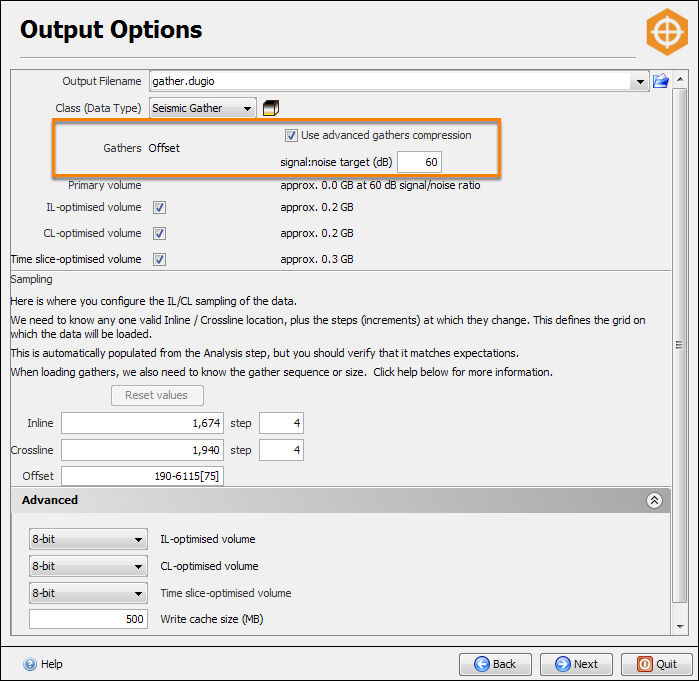 If they are required, you can still generate the optimised volumes after loading the gather in Insight.